The Armenians live on the mountainous land between the Black Sea and the Caspian Sea for over 2600. Today a modern nation known as Armenia exists, but the Armenian people have been conquered by many other empires throughout their history. An Armenian king adopted Christianity in 301CE, making Armenia the first Christian kingdom in the Middle East. The Seljuk Turks invaded Armenia in the fourteenth century, but many Armenian people held on to their language and Christian religion. The Armenians attempted to break away from the Ottoman Empire in the latter part of the nineteenth century. The Ottoman Turks feared that the Armenian people would support a Russian invasion of their Empire. The Ottoman Turkish fear of rebellion and the Armenian desire to break away from the Ottoman Empire led to several waves of persecution from 1894 to 1916 known as the Armenian Massacres. When the Ottoman Empire joined World War I in 1914, many Armenians welcomed a Russian invasion. The Ottoman government responded to this threat by driving the Armenians from their homes. Estimates vary because there was no reliable population data in the region at the time, but experts believe that as many as one million Armenian people died through war and starvation. Some historians consider the Armenian Massacres as an example of genocide. Genocide is the deliberate destruction of a racial or cultural group. After World War I, Russia became a military empire known as the Soviet Union. Armenia was taken over by the Soviet Union in 1922 but declared independence after the fall of the Soviets in 1991. 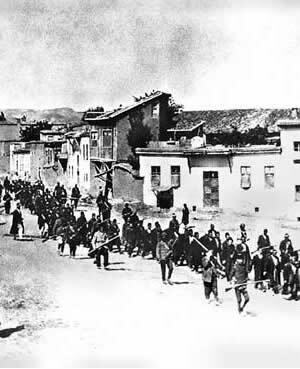 Armenian civilians were marched to prison by soldiers of the Ottoman Empire in April 1915. 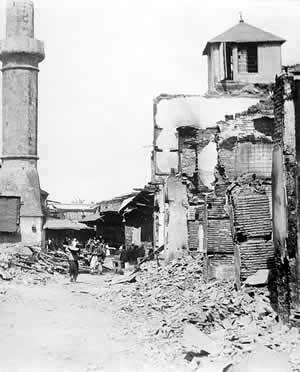 A massacre of Armenian Christians in the city of Adana in 1909 resulted in the deaths of as many as 20,000–30,000 Armenians.